This 100% online course prepares health & fitness professionals with the knowledge and skills of Cardio Pulmonary Resuscitation (CPR) in a health club setting. Our course incorporates real-life scenarios that one might encounter in a health club. 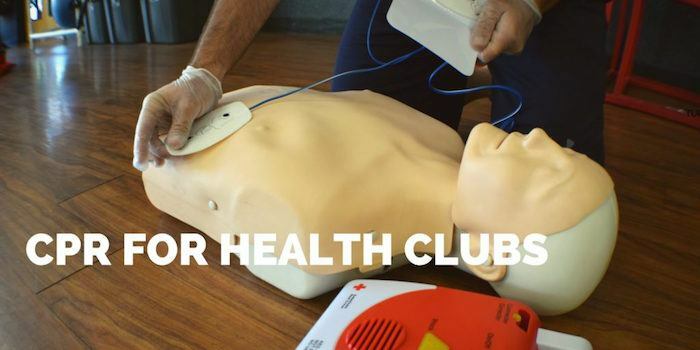 The CPR for Health Clubs training adheres to the internationally accepted guidelines established by the International Liaison Committee on Resuscitation (ILCOR). Upon completing this course, you can download and print your CPR card. Course Contents: 5 online lecture videos, 5 lesson quizzes and a timed final exam. Valid for 2-years from exam date. Health & Fitness Organizations That Accept Our Certification! What makes our CPR certification different? For starters, our course is designed for those that work in the gym. The typical CPR course you’ll do in-person or online is meant for everyone. The examples are generic and meant to cover an array of industries. Even though our course uses the same science and guidelines are the same, the examples used and demonstrated are actual scenarios that someone working in a gym might incur. Second, the format and technology used to create this course is meant to keep you engaged and actually retain the information. How many CPR courses have you been to already that were quickly instructed so that you could get back to work? The online CPR for Health Clubs certification from KIPS gives you all the tools you need at your own pace—and at an affordable price. What type of guidelines, accreditation and standards does CPR for Health Clubs follow? The CPR for Health Clubs training adheres to the internationally accepted guidelines established by the International Liaison Committee on Resuscitation (ILCOR). The CPR for Health Clubs training adheres to 2015 ECC Guidelines and is based upon the Consensus Conference on Cardiopulmonary Resuscitation and Emergency Cardiovascular Care Science. ILCOR members include the American Heart Association, American Red Cross, American Health Association, European Resuscitation Council, Heart and Stroke Foundation of Canada, Inter-American Heart Foundation, Australian Resuscitation Council, New Zealand Resuscitation Council, and Resuscitation Council of Southern Africa. This curriculum is equivalent and follows the same guidelines taught by American Heart Association, American Red Cross, National Safety Council, and the Heart and Stroke Foundation of Canada. It should. If your place of employment accepts online formats for CPR (no hands on portion) then our course should work just fine! KIPS is committed to providing you with an online CPR certificate which will meet your safety education needs and the accreditation needs of your job. Our guidelines follow those set by the American Heart Association, so you know you’re getting the most up-to-date information. After completing the course, you will be able to print your online CPR certificate. At KIPS, we believe taking CPR classes and getting your online CPR certificate should be entertaining and educationally rewarding. We hope that by completing this course you will be able to use the information provided (if necessary) and retain the information for any future courses!